Bring your boat and tie up for a week for some of the best fishing on Cape Cod. Or just relax and watch the world drift by, while the kids build sand castles, catch crabs, pick up shells, or learn to sail or row. Spacious waterfront deck perfect for deck chairs, sunbathing, and reading. If you are looking for the perfect family vacation spot, without all the glitz, and hustle and bustle, see if this family heirloom is for you. If you tire of these simple pleasures, you are only minutes away from Hyannis Area Shopping Malls, ferry boats, whale watching, excellent restaurants, golf courses, bike trails, theme mini golf, public beaches, batting cages, driving ranges, waterparks, and National Parks. 5th generation Cape Cod Vacationer. It is in the blood. Enjoy every minute of vacation time on Cape Cod, even when replacing shingles with willing family members. Multiple generations have learned to swim, sail, boat, canoe, kayak, fish and work on this property and on Bass River and Nantucket Sound for over 100 years. May the next generation be so inclined and lucky. Please share the spirit of Cape Cod with us too. Many of our guests enjoy making their family memories at this house year after year. From watching their children or grandchildren master the arts of biking in the driveway, swimming, fishing or boating, or just relaxing by the water and enjoying the salt air and ocean breezes. Every day, every year, the time passes, but the Cape remains a constant reminder of unlimited potential of each day and night spent with family in this setting. Summers on Cape Cod always end too soon, so come back next year. 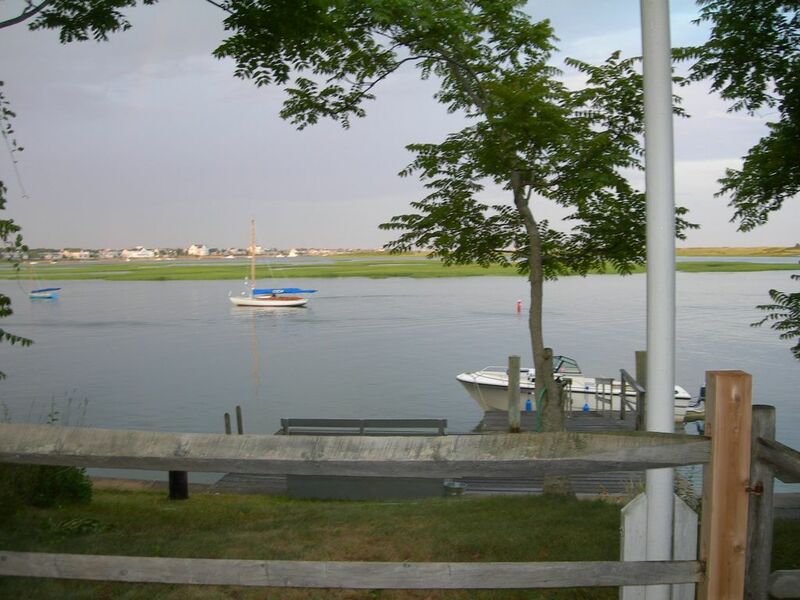 hard to beat the views of Bass River from this private dock and beach. Sit on the Deck Box or lounge chair and enjoy, enjoy enjoy! wanting too much sun. Close enough to Town and shopping centers, yet private residential area is unlike some vacation sites. No need to leave the property for entertainment and water activities, most of our guests spend their time down at the water. Yet if you are fond of large public beaches the house is centrally located on Cape Cod and perfect for day trips to P-town, Hyannis, Chatham or many other nearby adventures. The Judah Baker Windmill is one block North of the house and the quiet neighborhood boasts some historic Captain's houses. The Great Island Bakery, a short walk from the house is the place to grab a coffee and Pecan bun if you get there early enough.